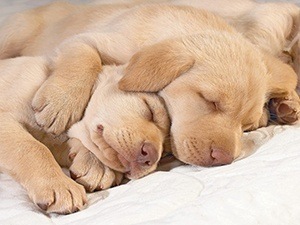 When a day of playing and intense activity comes to an end, Labradors need a comfy place to relax and get some sleep. Dog beds are an essential piece of gear for any dog owner looking to provide their pooch with all the comforts they need. There are a number of unique dog beds on the market. 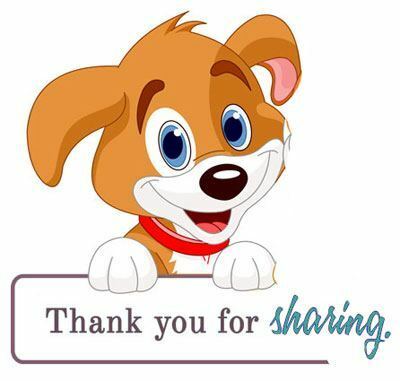 However, you may soon realize that finding a bed suitable for a lovable Labrador is easier said than done. These large dogs have unique needs that need to be addressed. Due to their large size, beds have to be spacious enough spread out. Furthermore, beds need to have adequate cushioning to support their fragile joints and prevent sores from the hard surface underneath. Here are some of the best dog beds for Labs and a few tips to help you make a decision that's right for your dog. This bed from Happy Hounds is designed for dogs with joint or hip problems. It's an orthopedic bed that has a thick rigged cushion. The cushion measures roughly 5 inches thick for great support. The cover is removable for easy washing and utilizes two different materials. This reversible design makes it easy to switch up the comfort level between seasons and helps to add durability. One side has heavy-duty microfiber while the other has thick sherpa material. The bed is water resistant and built to last. The cover utilizes double-sewn box edging for strength. With its large 36-inch by 48-inch size, it's great for Labs looking for comfort. If your dog is looking for a place to cuddle, this dog bed is a great option. It's an oval bed that features raised sides to support your dog's head as they lay down. The largest size is 40 inches long by 28 inches wide. The sides are approximately 7 inches high. Thick padding is formed to create the unique shape while providing all the comfort your dog needs. It utilizes a slip-on cover that conforms to the bed's shape. Durable material is used on the outside of the bed while the inside is made from plush imitation lambskin. An elastic band on the bottom keeps the cover in place while making it easy to remove for cleanups. Available in large, extra large, and giant sizes, this bed from Big Barker has more than enough room to accommodate a growing Labrador. It's made from thick orthopedic foam to support your dog's joints throughout their life. The main portion of the bed measures 7 inches thick and is made from three separate layers of foam. There's also a contoured portion on top for your pup's head. The foam is strong and won't flatten over time. The company even provides a guarantee against it. The cover is made of soft microfiber that's available in three different colors. It also has a durable zipper for easy maintenance. With its double-layer of protection from messes, this bed is built to last. The main outer layer is comprised of 100% cotton denim. It's easy to wash and has extra stitching to ensure that it'll last for years to come. Beneath that layer is a zippered waterproof case. It protects the memory foam from moisture and bacteria. 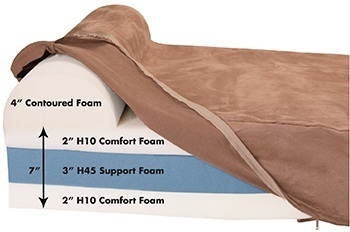 The 4-inch memory foam is hypoallergenic and very dense to provide ultimate orthopedic support. The bed comes in a variety of sizes and even includes an extra suede cover. This cover is non-slip and can be utilized whenever the denim cover is being washed. This bed measures roughly 49 inches long by 35 inches wide. It utilizes a soft cushion that measures approximately 8 inches thick. It's large enough to support a Lab and uses durable materials that can last. The exterior is made of a combination of heavy-duty canvas and soft plush. The plush is used on the top while the canvas helps to keep the sides protected and stable. The bottom features skid-proof material. A discrete zipper makes removal of the cover simple. There's also a separate waterproof lining inside for added protection against moisture and spills. If your dog likes to lounge around all day, this unique bed from PetFusion is an opulent choice that will keep them comfortable. It features a thick 4-inch cushion of solid memory foam for joint and hip support. In addition, a sizable bolster is included as a head rest. It's filled with recycled polyfill. The entire bed is covered with a water and tear resistant material made from polyester and twill. The cover is easy to remove via a zipper. The bed also features a non-skid bottom. The bed is available in a number of different sizes. It's also designed to look like a modern piece of furniture. It's a stylish and comfortable option that any dog would love. Labradors are a large breed that grows up quite fast. While it may be tempting to get them a smaller bed as a puppy, the pooch will quickly outgrow it. It's a good idea to go with beds that are labeled as "Large" or "Extra Large," even if you have a puppy. The bed should have enough room to spread out a bit. Labs love to lay flat after a long day and will choose the floor over a bed if there isn't enough room to do so. It's important to provide your dog with all the space they need to get comfortable. The material of the bed can affect its comfort and its maintenance requirements. Materials like thick cotton or polyester are soft enough to lay on and can handle the rigors of machine washing. It's best to avoid materials that can become damaged over time. Synthetic materials and leather are easily d﻿﻿﻿am﻿﻿aged by claws and may not be the most comfortable material for your pup. It's also good to go with a bed that has a removable cover. Labs are known for their adventurous nature and will often bring dirt, moisture, and a variety of other messes to bed with them. Eventually, their comfortable bed will start to smell awful. A removable cover makes it easy to keep odors at bay and ensure that the bed is always fresh. To ensure that you don't need to buy a new bed every few months, invest in a high-quality bed that's designed with durability in mind. Look for thick materials and reinforced stitching that can keep the bed together for years to come. Labs are notorious for their chewing, especially in the younger years. The bed should be designed to withstand anything your dog put it through. Another great durability feature is a waterproof lining around the cushioning or foam. While a removable cover is great for dealing with messes on the surface, a lining can keep the inside free from smells, mold, and bacteria. There are a few different types of dog beds that utilize different core designs. Certain designs are better suited for different needs. For example, a simple dog mat is great for dogs that spend their nights in a kennel. They feature the same thick cushioning and a comfortable cover you'd expect from a quality bed. However, they're sized to slip easily into a kennel. Raised dog beds are great for Labs because they're easier to get into and can keep them cool throughout the night. Some aren't made with a cushion at all. Instead, they utilize stretched fabric that promotes airflow beneath the dog. These particular beds can also be used outdoors. Alternatively, indoor raised beds may feature additional storage f﻿﻿or toys and extra cushioning to make your dog feel at home. Another option is a durable basket filled with soft bedding. This option is great for dogs that still having a chewing problem. Made from thick plastic, the bed is capable of taking a beating while still providing enough room to get comfortable. They're also easy to clean and can be used with mats or blankets. Some additional features, while not always necessary, can be very useful for improving comfort and handling certain issues. Heating and cooling beds are great for relieving sore muscles. They include an element that is inserted beneath the cover. It may be powered by a wall adapter or batteries. It then cools down or heats up as the dog sleeps depending on your particular settings. 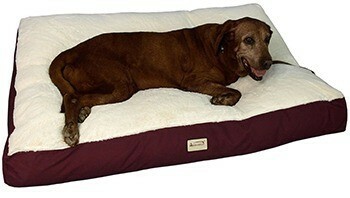 Orthopedic beds are ideal for aging dogs. They're made up of memory foam and can help ease the pressure on joints. Labradors can suffer from joint and hip problems as they get older. 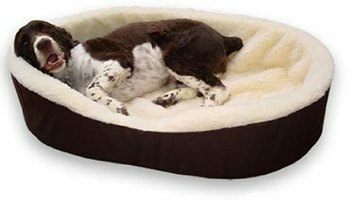 An orthopedic bed will prevent further damage while making your canine companion much more comfortable. While the style of a bed isn't a concern for your Lab, it can help make your home a bit more visually appealing. Beds come in a variety of styles that can match any type of decor. It's good to treat a dog bed like any other piece of furniture in terms of design and function. It should look great while being accessible to your pup at all times. Since the bed will likely be in a visible place in the home, such as a den or living room, why not go with an option that makes it look like it's meant to be there? This will ensure that your home always looks great and you won't have to worry about stashing it away when guests come over. Your dog is another part of the family, so why not provide them with a comfortable bed they'll love to sleep in? When choosing the right bed, it's important to consider your pup's behavior and unique needs. The right bed will be your dog's go-to spot for rela﻿xati﻿﻿o﻿﻿n and help them recharge for the next day of fun.